Warming up is often viewed as a waste of time, but believe me, it is worth the effort. It is so easy to just get ready, grab the racket, jump in the car, and rush on to the court. Once on the court it is too late to start thinking about how slow you feel, and how stiff the body is, and that the dinner/meal was of not use to the game, except to make the legs feel heavy, and the stomach unsettled. I agree, that is a no stress way to have fun. However, to escape injury as well as play our best, it is recommended we spend ten minutes on the pregame warm-up. In cold weather our bodies take longer to get warm, and we cool down much quicker. I see NOBODY in my club who does post-game stretching and warming down. Some players wave their arms three or four times and shake their hips for ten seconds. I do warm up/down becasue I used to have a good and carefull coach in my previous club. Actually, warm up and warm down became part of my game or practice routine even if people around are laughing. Totally agree with "no static stretching before the game" and the reasoning, the dynamic 'limbering up' is the way to go , IMO. Do the stretching after the game. Postgame warmdown is for flexibility gain. Also agree that PNFstretching is a great stretching technique. quite amazing the first time you try it. Actually I'll just copy/paste the article here - what do you think of this technique ? It's hard to imagine that Henry, Beckham, Gerrard and the rest could get much fitter. Footballers, it is said, are such highly-trained, finely-tuned perfectly balanced physical machines that there's little technology left to enhance their performance. But at Stretch we beg to differ. Active Isolated Stretching (AIS) could help any footballer prevent injury and improve their game. If you stretch statically, holding each stretch and overloading it with weight before every game, you'll put untold strain on your muscles and starve them of much needed oxygen. After just five seconds of holding a stretch the tissue becomes locked, which stops blood and essential nutrients reaching the muscle cells, so it becomes less efficient and gets tired faster. AIS on the other hand, gently stretches muscles using a pumping action, forces purifying oxygen into muscle tissue and flushes out damaging toxins such as lactic acid. Most injuries in football occur at the very end of your range of motion. So if you kick a ball at full knee extension your hamstring will be fully extended. If you have to stretch through your muscle's natural barrier - the point at which your muscle starts to resist movement - and your muscle isn't properly warmed up, your in-built stretch reflex could engage causing a jerk or contraction just when the tissues are at their most extended. The result? A torn muscle that could take up to six weeks to fully recover. So instead of getting injured, try this AIS stretch for your hamstring. Lie down on a yoga mat or mattress. Isolate your hamstring muscle by rotating and positioning the hip joint so that the leg is straight and the knees turned inwards to isolate the inner fibres of the hamstrings. Contract the opposing muscle group - in this case the quadriceps (thigh) and relax your hamstring muscle. This will switch off your hamstring muscle and make it easier to stretch. Hold the stretch at its maximum point for just two seconds, to reduce the chances of activating your stretch reflex, which will cause your muscle to switch off. The stretch shouldn't be painful but just lightly irritating. Repeat the stretch at least 10 times in a row. This will increase blood flow to your muscle to provide nutrients and oxygen. Do this stretch post game and you'll be flushing out waste products and helping your muscles recover faster too. Draw your heel up to your bottom and grasp your ankle. Gently extend your hip by pushing your hips backwards until you feel a light irritation in your thigh. Hold the stretch for two seconds then release and return to the start position. Repeat at least 10 times in quick succession. Your muscles help to absorb pressure on your body and support your joints, so keeping them balanced and healthy is crucial if you want to avoid injury and stay at the top of your game. Pregame warm up is for injury prevention. Yes, of course, we have the various parts of the prematch preparation, eg getting our heart rate up to about 120bpm for a few minutes (to get the blood into the muscles), then it is easier to go into full stretch when the muscle is warm, ghosting movements taking the joint through the full range of movement expected during the squash game (which for squash can be pretty strenuous, not sure about the diving like John White did in the British Open!). PNF stretching is what I used for my State juniors who were often very stiff after a few hard match; otherwise the first game can be almost lost before the body can adjust to the speed of the game, (body sluggish/mind sluggish) and it definitely worked, even though they would grumble, but smile when they won. The other good thing, as you said about preparation, is getting the mind into a performing state with the visualisation, and mental rehearsal of the game. There is an ideal performing state and it is a wonderful thing if you can get into that groove early in the match. It sounds as though you are fit and strong and young and brought to squash some of the attributes of your athletic career and that sure helps. Just this morning I was speaking to an Over 55 Australian Masters runner-up. who has just returned from Canberra after 2 weeks of individual and teams competition. The most I got out of the conversation was the players attending the presentation in bandages, crutches, linament - so the results could have been more about "the survival of the fittest"! I completely agree that a good warm up will enhance your game. Not only does it prepare one physically, but mentally as well. I always try to prepare a game plan before a match, and I find that once I start my warm-up routine, it becomes very easy to focus on general and specific things I want to accomplish. When I have not had the chance to warm up, I feel mentally scattered and I usually perform poorly on the court. Little things like unforced errors, loose shots and poor length creep in - which in turn adds to my frustration. But when I psych myself up during a good warm up and prepare a game plan (nothing complicated and it depends on the opponent - usually something like "keep it tight, good length, on your toes") I am able execute much better. And the mistakes I do make don't seem to bother me as much. One thing I never do for a warm up though, is static strecthing. I know, some of you may think I'm crazy, but I think my reasoning is sound. (I'm from a track background and have always has a keen interest in sport physiology). Static stretching is contraindicated for force production - it will reduce the strength of the muscle being stretched, which is the last thing you want to do before a match. Also, a static stretch and hold (think of the classic hurdler's hamstring stretch) moves your joint into an angle that you could not do on your own. (Try raising your straight leg up parallel to the ground, mimicking the hamstring stretch, and see if you can get is as far as you can while lying down and pulling yourself closer to your lower leg. Betcha can't) People use straps, bands, body weight, and pressing against solid objects to facilitate going deeper into the stretch. Which means that your central nervous system has nothing to do with the movement - which is bad. So you ask, "what do you do then smart guy?" Well in addition to getting my heart rate up a bit with squash specific movement patterns, I do lots of dynamic flexibility work - moving my joints just as far as my CNS will let them go. Think things like trunk twists in each movement plane, donkey kicks on all fours, cariocas. I start slowly and gradually work up the intensity. Same thing with the swing. I'll swing in the air on the forehand and backhand, mimicking different shots and gradually work thing up. I don't have any links, but check out track and field websites for more dynamic warm up work. 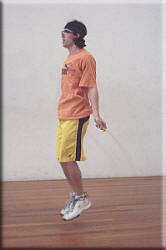 These won't have any raquet specific drills, but this site has some good ones. As for static stretching, I do that after the match. I just think that decreasing the strength of any muscle prior to physical activity can only increase the likelyhood of injury.